This colorfully illustrated multicultural children's book presents Balinese fairy tales and other stories--providing insight into a rich oral culture. volume presents a charming collection of well-loved myths and tales from Bali. Comprising 12 stories that have been told by mothers to children over the centuries, the tales cover classic childhood themes--good versus evil, children versus adults, and so on. They make perfect new additions for story time or bedtime reading. The stories have appeared previously in a different form, but never so clearly and in such a way that the beauty of Bali and Balinese culture is evoked so well. 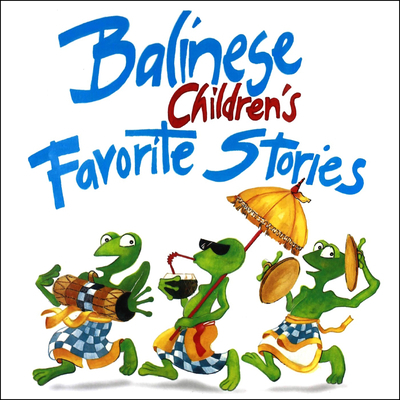 Narrated with an international audience in mind and illustrated with whimsical watercolors by Trina Bohan-Tyrie, Balinese Children's Favorite Stories will enchant six to ten year old readers all over the world. The Children's Favorite Stories series was created to share the folktales and legends most beloved by children in the East with young readers of all backgrounds in the West. Other multicultural children's books in this series include: Asian Children's Favorite Stories, Indian Children's Favorite Stories, Indonesian Children's Favorite Stories, Japanese Children's Favorite Stories, Singapore Children's Favorite Stories, Favorite Children's Stories from China & Tibet, Chinese Children's Favorite Stories, Korean Children's Favorite Stories, and Vietnamese Children's Favorite Stories. The stories are retold by Victor Mason, who first told these stories in a publication named The Haughty Toad. A keen ornithologist who conducts bird-watching tours in Bali, Mason also wrote The Birds of Bali. The stories are illustrated by Trina Bohan-Tyrie, a professional watercolorist currently living in Indonesia. Over the last 20 years she has exhibited in New Zealand, Papua New Guinea, Zimbabwe and Britain. Bohan-Tyrie holds joint and solo watercolor exhibitions in Indonesia, drawing inspiration from the country's colors, textures and people. She is a member of the British Watercolor Society.